We love when patients tell us we gave them the best dental experience of their life. That is always our goal! Take a moment to read through our reviews and see what others are saying about us. We look forward to providing you with the outstanding care you deserve. Within the past months Dr. Joel Gould has conducted a “Smile Makeover” on Maria. She suffered from smile dissonance, her smile was destroyed by domestic violence and Dr. Gould wanted to give her the smile that fit with the new Maria. Maria's Empowering Transformation by Dr. Joel Gould of Modern American Dentistry. Mike has had lots of old broken down dentistry replaced. Although skeptical at first, as his mouth continued to feel better and better he truly started seeing the value of good dentistry. 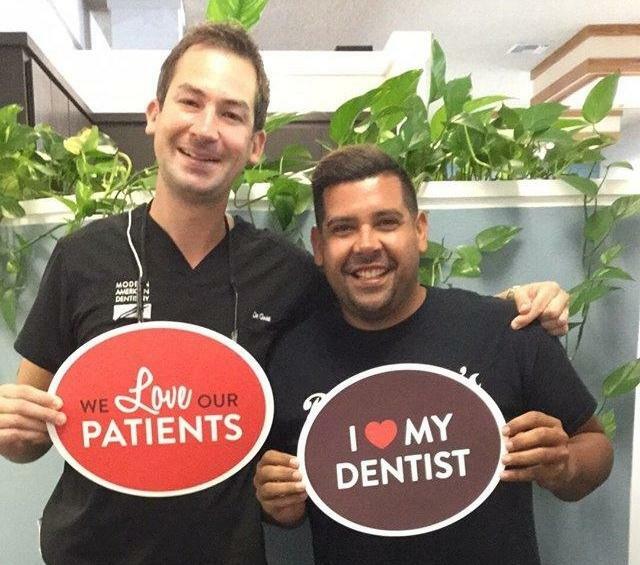 We love having patients like Mike at our dental office. Poor sleep has many side effects. Weight gain and fatigue are very common. Everyone should be aware that the earlier sleep apnea is diagnosed, the easier it is to reverse. Insomnia is biochemical, its not caused by stress, its caused by low Vitamin D.
Obesity and weight gain are often blamed in sleep apnea. As you can see, plenty of thin people have it too. It can happen to anyone who runs low on vitamin D.
No one would expect that a young thin person would have sleep apnea. It is caused by a hormone imbalance. Our supplementation program is easy to follow, and symptoms of fatigue and insomnia can disappear in as little as 2 weeks. Harry has been with the practice for a few months now. He originally came in with a tooth ache. He hadn't been in a long time and was very anxious and nervous. Luckily we caught the large cavity in time and he did not need a root canal. We did a few crowns and a deep cleaning and got him back to health. He is a happy camper! This is Heather's testimonial. Heather was a very nervous patient due to her bad previous experiences with other dentists. We have worked over the last couple of years to get her mouth back to health. We did some extractions for broken teeth which were later restored with dental implants. We have also done some fillings and crowns and she is now officially cavity free!! "I can't say enough. The entire office staff is professional and warm. Dr. Gabe is the best. I wish i had a dentist like this many years ago, i would have been better about going to the dentist. Let me not forget the hygenists, both are superb." - Linda W.
I have been searching for a quality dentist for a while! "Dr. Gabe was really great. He is very straight forward and honest about what work I need. He wasn't like other dentists I have seen, trying to tell me I needed this or that just to make money. The office is really nice and modern and they have top of the line equipment. The hygienist was also very good and thorough. Dr. Gabe spent the extra time to discuss my teeth and make recommendations. I will definitely go back, I have been searching for a quality dentist for a while!" - Stacy J. Most comfortable cleaning I've ever had - no pain whatsoever! "Everyone was very friendly. Service was professional and very well done. Most comfortable cleaning I've ever had- no pain whatsoever." - Krista B. "Dr. Gabe was wonderful. I've always been afraid of dentists and I've never liked my dentist. Dr. Gabe changed all of that. He's so nice and gentle. I'm actually excited to start having work done." - Cameron S.
"Kenitha , the dental hygienist always does a great job. " - Kathy H.
"Dr. Gabe has done a fine job with my dental implants and he takes the time to listen to any jaw and throat problems I have experienced. He is very knowledgeable and I would highly recommend him. " - Jeannea J. "These guys are the best, I used to go to Dr Gould but Dr Gabe is much closer for me, Dr Gabe was super nice and friendly. He did not beat around the bush and after a thorough exam he let me know I had two cavities & needed a deep cleaning. He asked if I wanted to reschedule or if I had time to do it now, 1 hour later I am walking out with what feels like a brand new set of chompers. Dr Gabe even called me days later to make sure I was ok. I have since sent him two of my dad's friends who both needed dentures. They are both over the moon about their new teeth and I can tell their quality of life has improved. Dr Gabe will always be my dentist and if you're smart he will be yours too!" - Blake W.
Dr. Gabe, Jennifer and the entire MAD team gave me my smile back! Professional, friendly, knowledgeable - what more do you need! I know that everyone hates visiting the dentist, but I happened to enjoy it! I would have to first thank Joel Gould, who was my initial chosen dentist from 7 years ago. His practice in Manhattan Beach is linked with Modern American Dentistry and every step of my teeth journey has been treated with the utmost care and compassion. I was very excited to visit the new office and had trusted that anyone under Joel's belt would be someone to consider. After making my appointment and visiting the office, I automatically became connected to the staff and appreciated the Google scope application in which allows you to view the entire office in current date. The receptionist had a very friendly and welcoming personality and the office was very Modern just like the practice in Manhattan Beach. My first appointment was what I expected, no pain at all. I even had soreness on one of my gums and had eaten so much pineapple recently that my mouth had felt like it was not set up for any treatment, but I felt great. I almost fell asleep! The technician who worked on my teeth cleaning was very welcoming and someone that I could see my self hanging with. After visiting with Dr. Gabe, I had felt so comfortable and was surprised that my visit was short. The other receptionist who prepared my future appointments was also very kind, funny and down to earth...just like the others. Absolutely recommend this practice and Dr. Gabe because it was very close to me, I had a comfortable and cared for experience and I highly trust the dentists and staff. It feels like family is watching over you and that's what you need when it comes to something fragile and delicate like your teeth! This video testimonial from Kim, a real patient at Modern American Dentistry in Santa Monica, as he discusses the exemplary service he received from Dr. Joel Gould in identifying and correcting his Sleep Apnea. Modern American Dentistry is committed to improving the health and aesthetics of your smile at their three Southern California locations. We value health-centred and wellness-focused dentistry care in a welcoming environment. Our state of the art care is provided with minimal discomfort, while maintaining long-lasting, meaningful relationships with patients. We are committed to providing long-lasting, healthy smiles, and customized treatments to meet our patients needs, recognizing that everyone’s smile is unique and different. We also provide state-of-the-art cosmetic dentistry, with careful focus on aesthetic, health and wellness. With locations in Woodland Hills, Santa Monica, and Manhattan Beach, specializing in general, cosmetic, and restorative dentistry, we are confident we can create a custom health plan for you and your smile. We are committed to listening to all of your concerns and wants in order to provide you with second-to-none care, in a safe, comfortable and friendly environment.